Will Obama's coattails help or hurt in the midterms? 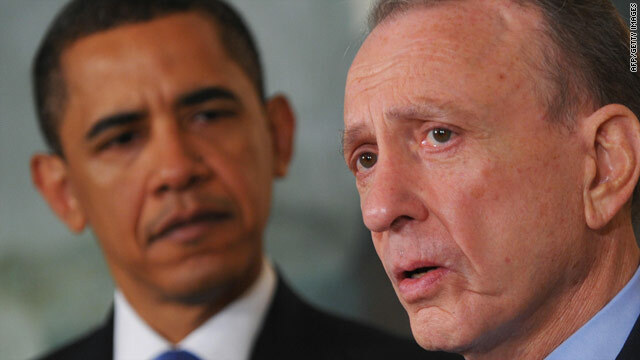 President Obama's support wasn't enough for Sen. Arlen Specter in Pennsylvania's Democratic primary. (CNN) -- With his loss in the Pennsylvania's Democratic Senate primary, Sen. Arlen Specter became the latest high-profile candidate that a boost from President Obama couldn't save. Specter, the Republican-turned Democrat, lost Tuesday to U.S. Rep. Joe Sestak. Observers called it a bruise for the White House. "Arlen Specter losing is a bit of an embarrassment for the president of the United States," said John King, CNN's chief national correspondent. Specter, a longtime Republican lawmaker, changed his party affiliation last year. He said that the Republican Party had moved "farther and farther to the right," pushing him more in line with Democrats. Specter also cited the difficulty he faced in winning the Republican primary against former Rep. Pat Toomey as a factor. Video: Specter's loss part of Obama trend? The switch helped Democrats briefly secure a filibuster-proof majority of 60 seats in the Senate. At the time of the party flip, Obama said to Specter, "You have my full support, and we're thrilled to have you." Obama visibly supported Specter's election bid, appearing in television advertisements and recording a robocall for the five-term senator. But the president resisted heading north to Pennsylvania on a late rescue mission as he had done for other unsuccessful candidates this year. Obama made an eleventh-hour visit to Massachusetts in January, but it wasn't enough to save Attorney General Martha Coakley. She lost the special election to fill the late Sen. Edward Kennedy's seat to newcomer Scott Brown. Another trip a few months earlier to try to secure a win for New Jersey Gov. Jon Corzine failed, and Obama's campaign appearances for Virginia gubernatorial candidate Creigh Deeds didn't translate to a victory for the Democrat, who lost last year to Republican Bob McDonnell. The anti-Washington message was also heard Tuesday in Kentucky, where voters knocked off the Republican establishment-picked candidate and instead elected Tea Party favorite Rand Paul in the state's Republican Senate primary. "I think that Washington has been put on notice. And I also think that when you look at the midterm elections, though, it's going to be about Barack Obama. It's going to be about his policies. It's going to be nationalized. And that should scare every single incumbent in Washington in a sense, because they're going to be held accountable," CNN senior political analyst Gloria Borger said. But Mark Halperin, senior political analyst for Time magazine, said the anti-Obama sentiment is exaggerated. Halperin noted that Tim Burns, the Republican candidate in the special election to fill the late Rep. John Murtha's seat in Pennsylvania, barely mentioned Obama's name on his campaign Web site. Burns lost the race for Pennsylvania's 12th Congressional District to Democrat Mark Critz, a former Murtha staffer who vowed to continue his legacy. "You think back to 1994 when the Republicans had their great year picking up a lot of House seats. Bill Clinton was the issue in these swing districts," Halperin said. "This is the ultimate swing district. It's the only district in the country that John Kerry won [in 2004] and then John McCain won [in 2008]. And yet the Republican candidate there is not emphasizing, trying to link the Democrats with Barack Obama. To me that suggests the president's position is not as weak as some of the commentary," he said. With Democrats holding on to the House seat in Pennsylvania and Democratic Sen. Blanche Lincoln advancing to a runoff in Arkansas, Tuesday's outcome sent a mixed message. The results reinforced the perception of anger across the country against Washington politics as usual, but also showed the public discontent may be aimed at both Democrats and Republicans. With some tough primary battles for Democrats still ahead, Obama will have more chances to flex his political muscle, and his opponents will have more time to judge his strength. CNN's Mark Preston contributed to this report.